D'arcy's father plunges his car into a river and dies. This forces D'arcy to both deal with her loss and the possibility that her father's death was intentional. D'arcy's relationship with her half-sister, Claire, is strained, and the situation worsens in the wake of their father's death. A police report confirms that the father's death was a suicide. D'arcy finds her father's suicide note and learns that he had ALS (Lou Gehrig's disease). D'arcy is pressured to get on with her life, but this forces her to become more detached from her friends and her mother. Then she meets Seth Thomas, and the two become romantically involved. As it turns out, Seth's brother committed suicide one year earlier. Unable to continue living under the shadow of his brother's death, Seth attempts to commit suicide. Thinking that Seth is dead, D'arcy runs away. She spends time and drinks alcohol with a homeless girl named Harmony. When D'arcy learns that Seth survived, but suffered a stroke, she decides to return to care for him. D'arcy accepts her father's death and resolves to repair her relationship with Claire. I get an image of my dad, driving down the road, coming to a turn, hitting the gas, twisting the wheel – No. No. No. Her body sags. “He was sick,” she says softly. She reaches out as if she’s going to touch me, but she doesn’t. Her hand hovers in the air for a moment and then drops. “He wasn’t --,” she begins. 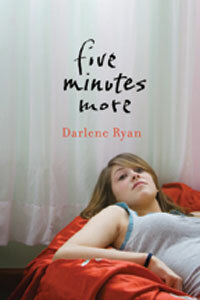 Five Minutes More is a complex novel that deals with a range of serious issues from suicide and grief to teenage sexuality and alcohol abuse. The novel’s thirty-one chapters are divided into three sections – Autumn, Winter, Spring – which symbolically link the stages of grief with the changing seasons. In the first two sections, D'arcy experiences denial, anger, and depression, and her relationships with family and friends deteriorate. In the final section, Spring, D'arcy finally accepts her father's death and prepares to focus on her own life and the lives of those she loves.